We're pleased to report that the first annual Print Expo & Fair, held on Sep 29, in conjunction with the Doors Open Oakville, was a success. It was well attended by visitors from near and far, and received positive reviews all around. Thank you for the kind words and generous praises - they meant a lot to us. And, to those who had taken and uploaded photos and videos from the event - thank you. This year's PE&F is being held in conjunction with the Doors Open Oakville. We’d like to express our appreciation for all of the support we received from the Doors Open Program and the Oakville Historical Society - huge thanks to Andrea Stewart for her help. We’d like to thank the volunteers for generously giving up their Saturday to be here and helping out with the event - Stan, Mark and Greg from the Oakville Historical Society, Marilyn, Elaine, Gordon, Oliver, Lydia, Crystal and students from Ryerson University. Special thanks to Hailey Koenig and Sarah Howard for the bake sale fundraising effort for an Oakville-based charity, The Lighthouse Program which provides support for grieving children. The bake sale raised over $1,000, with the donor match program. Great job, Sarah and Hailey! Special thanks to C.J. Graphics Inc. for their generous help with the printing of the booklets, banners and signage - much appreciated. 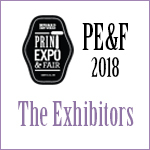 Last but not least, we’d like to thank Margot Cudmore and Joe Borges, of Pomegranate Letterpress, for their invaluable help in the marketing and promotion of the PE&F, and for their guidance in finding our way in the jungle that is social media.